Recently, I closed a lower kitchen cabinet door with a slightly more aggressive shove to push whatever dish was preventing the door from closing all of the way to slide back into the cupboard and allow the door to close all of the way. I’ve done this a million times before when I’ve been in a hurry. Maybe you have too. This time the cupboard decided to revolt after I closed the door and did a nice lean to the right. I broke the kitchen cupboard door hinge. I popped the plastic hinge cups that are common on boats, campers, and builder grade kitchens back into the holes. There. Fixed! Until the next time I opened and closed the cabinet door. Gentle close. Wonk. Door shift to the right. My preferred fix is to rip out all of the kitchen cabinets and replace them with brand spanking new and beautiful cabinets and while I’m at it a whole new impromptu unplanned kitchen remodel. But that seems like a bit of overkill to repair a door hinge. Maybe? At least that’s the impression I get from the look on my husband’s face when I told him Door Hinge Repair Plan A.
I'm the reason we don't have nice things. A more realistic, quick and easy plan is to fix the door and hinge. 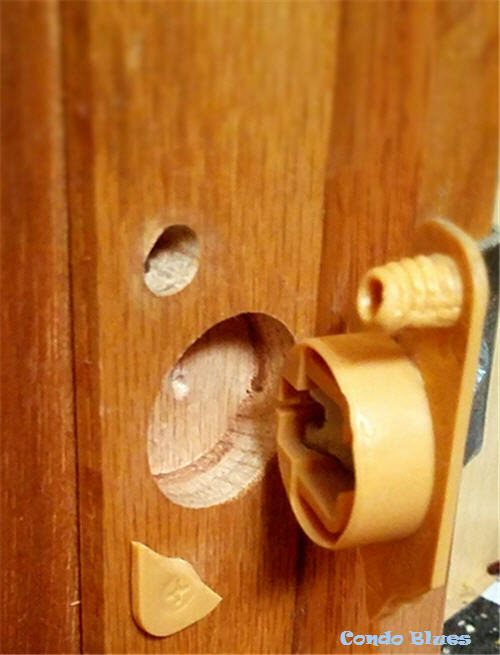 Fortunately the screws holding the hinge to the door and cabinet frame are not stripped. If they were, I’d fill the stripped screw holes with a small wood dowel or toothpicks and wood glue, let it dry overnight, and reattach the door. Nope in my case, the concealed hinge cup on the cupboard door decided it didn’t want to be friends with the cupboard door hole anymore. Let’s get these two crazy kids back together on a permanent basis, shall we? 1. 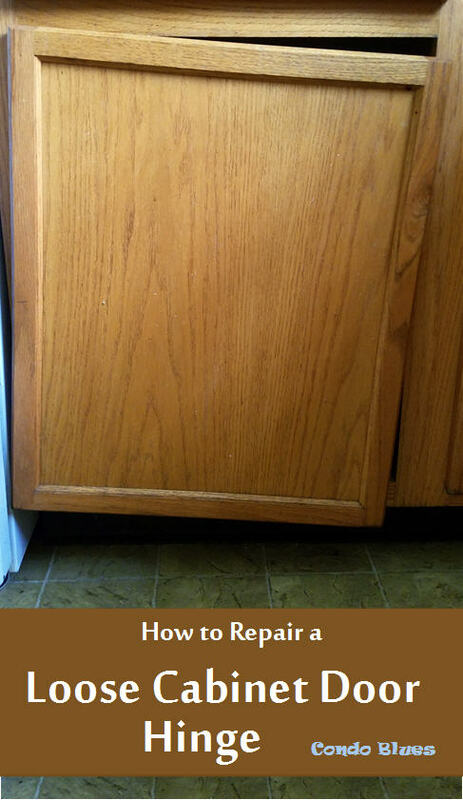 Use the screwdriver to unscrew the screws that attach the door to the cabinet frame. 2. Add E6000 to the hinge cups on the door hinge. I also ran a bead of glue a long the broken hinge pieces. I recommend using E600 because it is specially formulated to glue two objects made of different materials – in this case plastic to wood – wears like iron. I wouldn’t use wood glue in this situation because it is formulated to bond wood to wood only. 3. 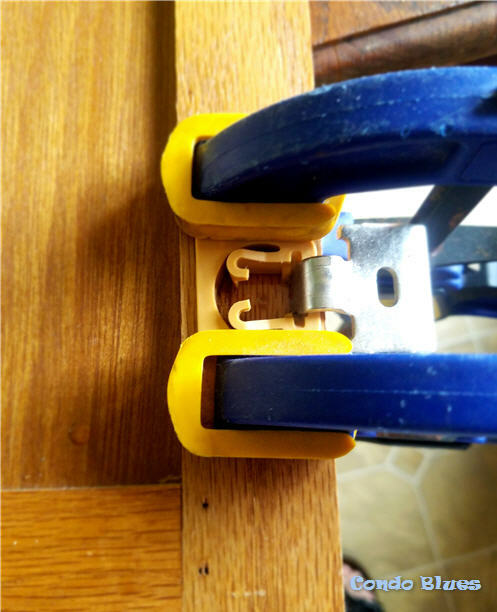 Attach a wood clamp to each side of the hinge to hold it into place until the adhesive dries. I let mine dry overnight. 4. 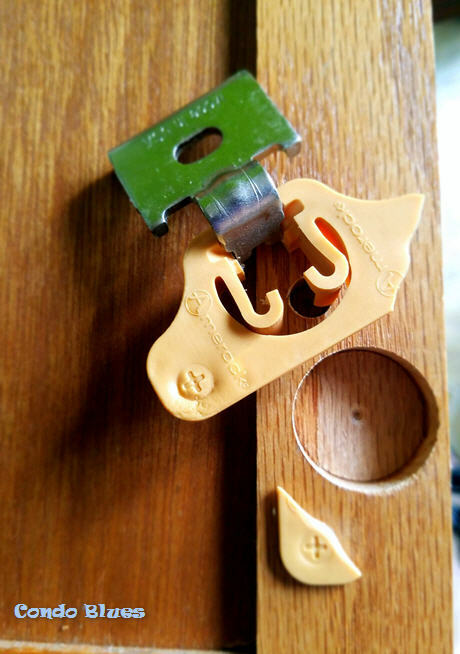 When the glue has completely dried, remove the wood clamps from the door, and use the screwdriver to reattach the door to the kitchen cabinet. Hope you remembered where you put the screws in Step One! 5. All done! It’s an open and shut quick fix!